Greg Vernick has been around food all his life. His mother ran Haddonfield Diet Shop in New Jersey, and his grandfather owned Philadelphia’s Friedman’s Market, a butcher shop and market inherited from Greg’s great-grandfather. So it was only natural that he followed the family calling, earning a culinary arts degree from The Culinary Institute of America and a degree in hospitality management from Boston University. During his career, Greg has applied that knowledge at a variety of venues. He completed his externship with Chef Ken Oringer ’89 at Boston’s Clio, and after graduation worked on the line for the opening of Jean-Georges Vongerichten’s Perry Street in New York City. 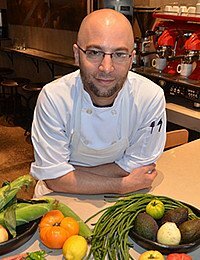 He would go on to serve as sous chef at Jean-Georges, Nougatine, and Spice Market, and eventually as corporate chef trainer for restaurants in Qatar, Tokyo, Vancouver, Boston, and Park City, UT. After a stint as chef de cuisine at New York’s Tocqueville, he moved to Philadelphia, and family once again played a key role in his life of food. He and his wife, Julie, worked to secure the capital and space for their own restaurant and, in May 2012, the couple opened Vernick Food & Drink, where Greg’s simple approach to cooking connected with customers. “The food is very approachable, very simple, very seasonal,” he explains. “People think simple is easy, but simple is not. We don’t have anything to hide behind.” The restaurant has been a success and, in 2015, Greg was nominated for the James Beard Foundation Best Chef: Mid-Atlantic award. The following year, Greg was recognized by the foundation and won the prestigious award of Best Chef: Mid-Atlantic.